2018 - a year chock full of revelations and experiments. 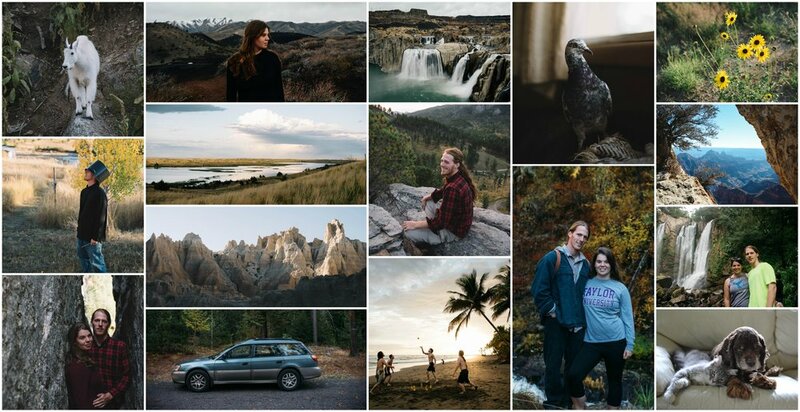 Weeks of idyllic road trips and vacations. Months of predictable work schedules. Both a downtrodden herb garden and wildly successful Jerusalem Artichokes. In the spring, we moved to the countryside in Deary. (I joke about our history with romantically-labelled towns. Valentine, Nebraska…. 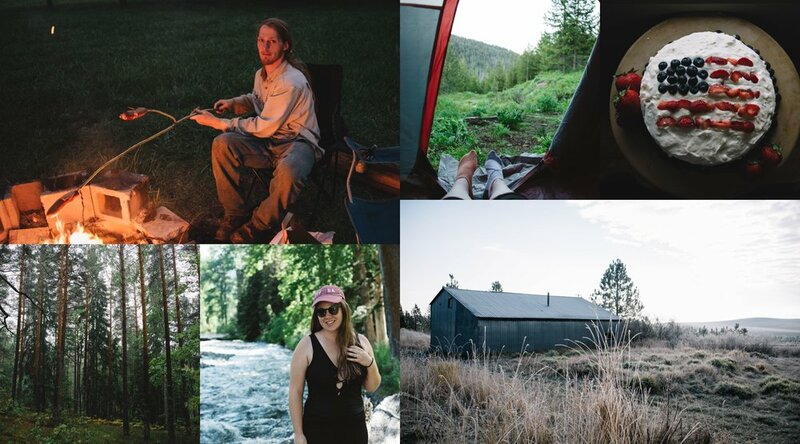 Deary, Idaho… ) Our humble abode just off the state hwy is a wonderful opportunity for us to experiment with homesteading. We impulsively purchased ducks and chickens and ignored our poor garden. Even now, in the dead of winter, we are scheming ways to get sheep and a spaniel doogie. We spent two weeks in September exploring the beaches and forests of southern Sweden. What wonderful autumn days! After I returned home, Charlie went on to live in the countryside of Värmland with an intellectual/author by the name of Lars Nordstrom. They spent several evenings communing with Norwegian neighbors, eating surströmming and swapping stories. Idaho Falls to meet Charlie’s family for a whirlwind weekend. Eagle Cap Wilderness - to camp in the Willowa Mountains and hike through national forest service. And a brief trip to the old home-state Missouri. Charlie’s one-year position at the Palouse Clearwater Environmental Institute terminated in August. He truly loved working at PCEI - being able to meet good people and camp in the Nez Perce National Forest for “work”. He is now employed at O’Reilly in Moscow, (just in time to buy discounted car parts for our Subaru ;)) Charlie spends his free hours bread-making, installing wood stoves, fixing various car problems, reading books about invasive species and grouse hunting. I (Laurel), am still at Latah Credit Union. In August I was promoted to back office where I am known as the “debit card and ATM gal”. I am thankful for my cushy job with good coworkers. Outside of work you can find me planning a small business, decorating our home, crafting, learning about herbalism and striving to be as hippie as possible. We look back on this year as a time of goodness and maturing. Charlie and I have both grown in stature as a couple and individuals. And we are so so thankful for our wonderful families who have supported us and encouraged us through it all. To each of you, (friends, family, coworkers and acquaintances), we wish you peace and blessings in this Advent season. Charlie and I kicked off 2017 at Uvita Beach in Costa Rica. We were there with the Herrick family having all sorts of grand adventures: on New Year’s Day we ate star fruit right off a tree, swam in the Pacific and fell asleep to the croaking of howler monkeys. Not a bad way to start off the year, am I right?! This surreal vacation was truly a premonition of the unexpected escapades and milestones my Love and I would encounter throughout 2017. Greenville, Illinois: Greenville was good to us. While living there, I learned that even southern central Illinois has rich beauty and history. During the long, cold months of early spring, Charlie finished up his last semester of college at Greenville College (which is now Greenville University.) Despite working four different jobs on top of classes, Charlie handled the load really well and graduated with a B.A. in Biology. Two hours after the graduation ceremony, we moved back to Missouri - just because we like to make Life complicated. Jefferson City | Holts Summit, Missouri: Our time in Missouri was short. Most of it was spent repacking moving boxes and catching up with friends. I got my wisdom teeth removed (woohoo) and Charlie filled out paperwork for his summer job. For Thanksgiving, Chaurel made a quick jaunt down to Cedar City, Utah to visit Andy and Kelly. This trip was a big deal for me - I had never seen Zion or the Grand Canyon before! We also made sure to hike through a slot canyon, go rappelling, soak in a hot spring and stop by Craters of the Moon. The West can be so breathtaking and bizarre at the same time! Now, in the dead of winter, Life has settled a down a bit. I am working full-time at Latah Credit Union and Charlie’s a restoration technician at Palouse Clearwater Environmental Institute. Slowly, slowly we are finding community, getting involved at church and becoming familiar with the beautiful Palouse area. Moscow is a town full of hippies (which I like), and outdoorsy people (which we both like). There’s always something exciting going on – concerts, contra dances, community dinners, environmental seminars and festivals. This place has captured our hearts. All in all, 2017 has been a good year. A full year. I wouldn’t change anything about it. I keep reflecting on the wonderful people we have met, and beautiful places we’ve seen. I’m thankful to our families for being a stalwart support and our friends for their marvelous friendship. May you all have a Merry Christmas and Happy New Year!